The CS655 is a multiparameter smart sensor that uses innovative techniques to monitor soil volumetric-water content, bulk electrical conductivity, and temperature. It outputs an SDI-12 signal that many of our dataloggers can measure. It has shorter rods than the CS650, for use in problem soils. 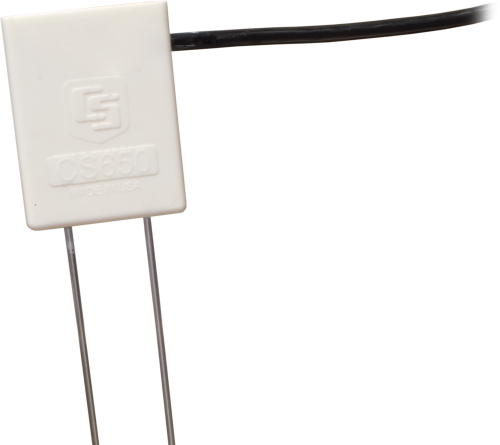 The CS655 consists of two 12-cm-long stainless steel rods connected to a printed circuit board. The circuit board is encapsulated in epoxy and a shielded cable is attached to the circuit board for data logger connection. The CS655 measures propagation time, signal attenuation, and temperature. Dielectric permittivity, volumetric water content, and bulk electrical conductivity are then derived from these raw values. Measured signal attenuation is used to correct for the loss effect on reflection detection and thus propagation time measurement. This loss-effect correction allows accurate water content measurements in soils with bulk EC ≤8 dS m-1 without performing a soil-specific calibration. Soil Suitability Short rods are easy to install in hard soil. Suitable for soils with higher electrical conductivity. Multiple CS655 probes can be installed within 4 inches of each other when using the standard data logger SDI-12 “M” command. The SDI-12 “M” command allows only one probe to be enabled at a time. The CS650G makes inserting soil-water sensors easier in dense or rocky soils. This tool can be hammered into the soil with force that might damage the sensor if the CS650G was not used. It makes pilot holes into which the rods of the sensors can then be inserted. Can the CS655 rods be shortened? Campbell Scientific strongly discourages shortening the sensor’s rods. The electronics in the sensor head have been optimized to work with the 12 cm long rods. Shortening these rods will change the period average. Consequently, the equations in the firmware will become invalid and give inaccurate readings.